Let’s face it, a few times a year, we need to clean all those spots that aren’t part of our weekly or monthly cleaning routine. 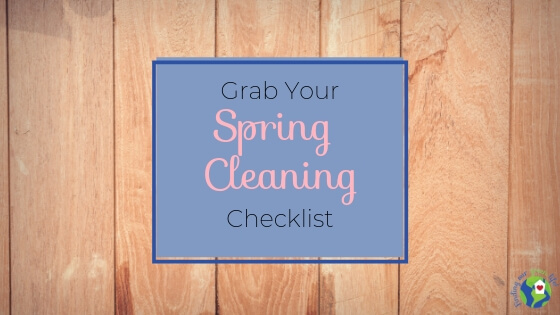 Who’s got their Spring Cleaning Checklist ready to tackle? Don’t have one, no worries, I’ve got one for you. My mother would probably say I have no business telling anyone how to get their home in order when my house can easily be described as mildly managed chaos. First rule of parenting, do as I say, not as I do. If you’re anything like me, you walk into your house on any given day and it is such a disaster, you know you need to clean/declutter/organize whatever you want to call it but you’re overwhelmed by figuring out where to start, you just shut down and sit and pet the dog instead. I actually put this Spring Cleaning Checklist of often forgotten tasks together for myself but figured there was no reason to keep it to myself. Plus, maybe somewhere in the depths of my mind, I will feel somewhat accountable to actually accomplishing these things. Stranger things have happened. Personally, I can see the big picture but I can’t manage it. 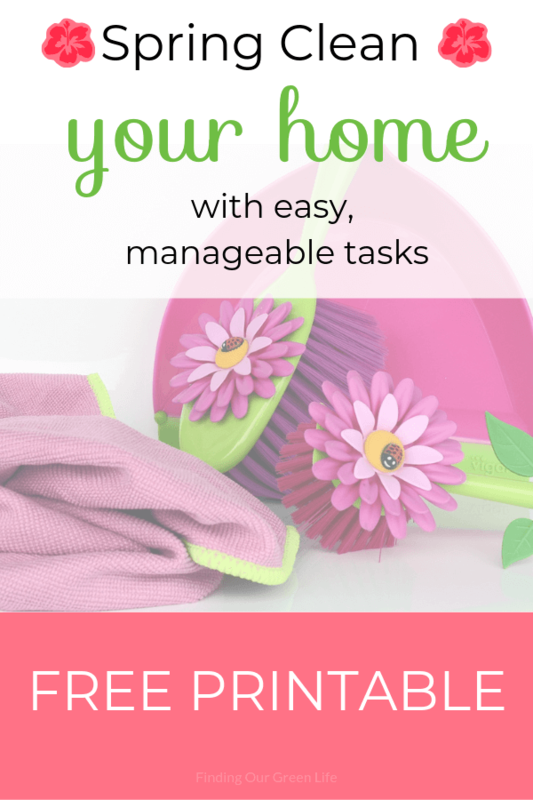 I can’t sustain the cleaning effort unless I really get into a good groove so breaking it down into smaller, more manageable tasks makes them all seem doable. Plus, I know I can commit to cleaning/organizing for 15 minutes a day. I’m a big list maker, I love a good list y’all. And even more than that, I love to mark things off that list so I made this chart that you can easily print off without using up every last drop of ink in your printer. Hang it on the fridge and do these things in any order you prefer. I grouped them together by room because it made more sense but be a rebel, go wild, do them out of order. I’d suggest getting your kids to help. Then you can get through it in much less time. Once you print off the chart, I’d suggest deciding if you are going to follow the tasks in order or tackle them as you wish. That way you can get together the products you will need, and enlist the kiddos). We use Norwex products in our house for literally every cleaning job, no joke! Norwex makes it easy because I can pretty much tackle everything on this list with just a few products. Think it’s time to pare down your cleaning closet? It probably is, check out the products I use right here. Hey, if you don’t own any Norwex products (well, I think you should) but don’t use that as an excuse, you can use what you have on hand but I’ve got a link at the bottom to some of the products I used to use before making the switch. You probably already know this but the air in your home is more polluted than the air outside. Nope, I’m not kidding. This is why swapping out toxic products for non-toxic products is so important for your family’s health. There are several easy things you can do to improve the air quality in your home. I’ve gotcha covered right here. Disclaimer: This post contains affiliate links. Any purchase you make by clicking these links will earn me a small commission but will not cost you anything extra. Please see my Disclosure page for more details. Bathroom Cabinets & Drawers – pull everything out, get rid of what you don’t need and give the inside and outside a good wipe down. 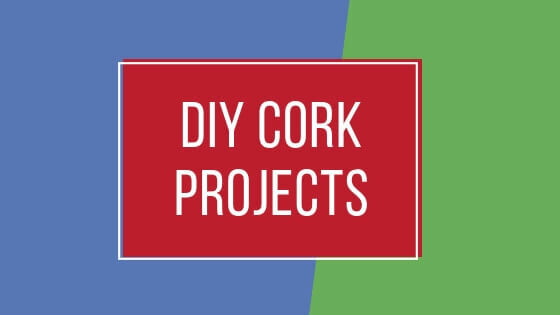 Shower Head & Curtains/Doors – put equal parts vinegar and water in a bag, put that around the shower head, secure with a rubber band and let sit 20 minutes. Then flush water through. Machine wash the shower curtain, I’ll let you decide what to do with the liner, if it’s torn or too moldy, I’d suggest tossing it. I have had good success with the Norwex Mold & Mildew Stain Remover. I haven’t found any product that cleans my shower doors like the Norwex Descaler. Spray it on, let it sit for about 10 minutes and wipe all that soap scum away. Bed Pillows – wash pillows in the machine. I realize this takes more than 15 minutes but your active work time is about 3 minutes. Flip & Rotate Mattresses – if you can flip the mattress, definitely do that, many these days can’t be flipped. I spray our mattresses and upholstered furniture with Norwex Mattress Cleaner to help remove contaminants like pet dander, oils, dust mites, etc. Air Vents & Filters – dust and vacuum the air vents and replace the air filters. Pet Bedding, Toys, Dishes, etc. – throw the pet bedding (and the plush toys) in the washing machine with a mild detergent, run the dishes, hard toys and ropes through the dishwasher (top rack) with vinegar. Wipe All Baseboards – give the kids a damp cloth to wipe down the baseboards. Washing Machine & Dryer – clean the washing machine and dryer according to the manufacturer’s instructions. Kitchen Utensil Drawers & Holder – pull out all the utensils from the drawers and the holder (like where you keep the spatulas, ladles, potato masher, etc). Wipe out the drawer(s), wash the holder and put it all back together. Kitchen Junk Drawers – I highly recommend NOT letting your kiddo’s do this. If your kids are anything like mine, you won’t be able to get rid of anything. Pull everything out, decide what needs to stay and what needs to go and put it back together. I found that random small cardboard boxtops make great drawer organizers. Dishwasher Inside & Out – clean the inside according to the manufacturer’s instructions and wipe down the outside. Microwave Inside & Out – I find that microwaving a bowl of water with either lemon juice or vinegar (whichever scent you prefer) for 5 minutes, then letting sit for 2 minutes, and then wiping out the inside makes the job much easier. Be careful when you remove the bowl of water because it’s going to be HOT! Stovetops, Range Hood & Vents – most days, the stovetop gets a wipe down after dinner but every so often, you need to pull off the grates and drip pans and really clean in there. I let those suckers sit in the sink with a pinch of Norwex Laundry Detergent and HOT water. Then I scrub them with a scrubber. If you’ve got glass top stove, you can skip this step. I also use a pinch of Norwex Laundry Detergent diluted in HOT water and a Norwex SpiriSponge to clean my range hood and vents. Oven Inside & Out – I’m not a fan of the self-cleaning option on the oven so I stick to my Norwex Cleaning Paste and Norwex SpiriSponge. I just remove the racks, wipe the oven with a damp Norwex EnviroCloth® to pick up crumbs and anything that’s not stuck on. Clean with the SpiriSponge and Cleaning Paste, wipe again with the EnviroCloth® and voila, done. Fridge Inside & Out – this one might take a while so save it for a day when you have some extra time. I suggest doing it before you do a big grocery shopping trip. Pull everything out and get rid of all the expired food, then wipe down the shelves, drawers and inside with mild soapy water. Kitchen Sink & Faucet – yes, it’s true, you do have to clean your sink, even though soap is always washing through it. While you’re at it, wipe down the faucet as well. Bathroom & Kitchen Trashcans – I like to take mine outside and hose them out, then clean with a mild dish soap, hose off, let sit to dry in the sun and then bring back in the house. Kitchen Cabinet Doors – Have your kids wipe down the cabinet doors (provided they can reach) with mild soapy water. Kitchen Table & Chairs – wipe down the table, get that crusted up ketchup, maple syrup, jelly, etc off and then wipe down the chairs. Dining Room Table & Chairs – if you are like me, that table is either full of dust or full of junk. We rarely use our dining room table for eating. Take everything off, put it back in it’s place and wipe down the table. Pantry & Cupboards – pull everything out, wipe down the surfaces and then put back the dishes, cups, saucers, etc that you still use. If you aren’t using it or it’s broken, dispose of it. For the pantry, pull everything out, check the expiration dates and act accordingly. Ceiling Fans & Fixtures – these are the most neglected places in our home. I use a Norwex EnviroWand® to get my ceiling fans and send my kids around with a Norwex Dusting Mitt to get the light fixtures. Couch Cushions – remove the cushions and vacuum anything that’s lurking under them. I spray mine with Norwex Mattress Cleaner but you could also sprinkle baking soda on them, let sit 10 minutes and then vacuum up. The baking soda helps absorb odors. Under Area Rugs & Mats – if you have area rugs and mats, somehow dirt and pet hair gets trapped underneath. I know, I’m just as surprised as you! Pull the rugs/mats back and clean underneath. I pull mine back a few times a year and clean underneath. All Light Switches & Door Handles – I send my kids around the house with a Norwex EnviroCloth® to wipe these. It’s a weekly chore through the winter months to keep sickness at bay. Dust All Furniture & Underneath – this one is pretty self explanatory, eh? Just make sure to get underneath the furniture with either a mop or a vacuum. You’ll probably find a few things you didn’t even know you lost. Winning Powerball ticket maybe? Blinds/Shades & Window Sills – if you have small kiddos, you’re likely to find more than just dust on those blinds. You’ll probably find dried up applesauce, rice, mashed banana, etc. Don’t worry, you’re not alone. Let’s face it, kids can hurl mashed up food everywhere. You’ll probably have to dust and then wipe down with some mild soapy water. Don’t forget the window sills, while you’re already cleaning and all. Office Desk – remove everything from the desk and throw away/recycle what you no longer need. Dust and wipe down and then put everything back, in an organized manner. Backup Computer & Organize Files/Photos – it’s always good to backup your computer files, that’s my hubby’s job. He’s my IT guy. You can definitely spend more than 15 minutes backing up and organizing pictures because if you’re anything like me, you’ll get lost in the memories and 3 hours will pass before you even look up. Save this one for the weekend! BONUS – Clean Out Purse – we throw everything in our purses, at some point, you’ve got to clean that sucker out. BONUS – Clean Out Wallet – get rid of all the business cards you don’t need, receipts, etc. BONUS – Clean Out Car – if you’ve got a minivan, this could take a week but get your kids to help because most likely, they made the mess anyway. Clean out the cupholders, the console, the seat pockets, etc. If you’ve got kids in carseats, you know how they like to stash things in the carseat pockets. BONUS – Clean Out Dressers – if you have some extra time, you could do this after cleaning out the closets. BONUS – Clean Out Phone – delete files and/or apps you no longer need/use. This is an easy one to do while you’re waiting on kids at activities or sitting in a waiting room somewhere. If you’re not ready to make the switch to Norwex products, you’ve got options. I put together some suggestions that include the products I used before switching to Norwex. You can check it out right here. You may have to dole out a few bucks to your kids but hey, they need to buy their Roblox bucks or VBucks or whatever they spend their money on these days. It’s surely not bubble gum like I spent my hard earned money on. Now that your house is spotless, what are you going to do with all your time? I suggest grabbing a nice cold drink and plopping down in a comfy chair on your deck and basking in the sun! Comment below and tell me if you did the tasks in order or did you pick and choose based on your energy level? I’d love to hear from you!